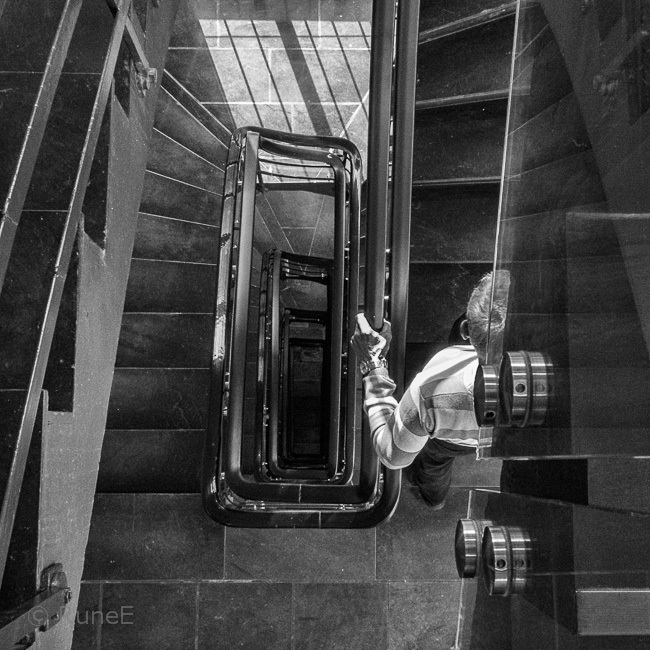 Staircases fascinates photographers, and monochrome accentuates the lines and structures. Seeing such a picture , I'm feeling between Alice in wonderland (falling down) and Hitchcock (The house of dr Edwards) !Very beautiful and strong in B&W! Råstilig komposisjon ... og helt knall i sort/hvitt! Ønsker deg ei varm og vårlig helg! I'm with Dina, I'm getting a little dizzy. Neat photo. Love the contrasts in shading and lines. Superb capture, Rune, as always! Your perspective of the stairs is awesome! Great way to start my day!! Enjoy your weekend! Flott svart og hvitt motiv. Stilig. Awesome! the Oslo Opera House? Fabulous shot -- makes me think of the play "up the down staircase." Lots of angles that make me follow the "up and down" of the staircase -- barbara. Love the way you captured the light in this one! Kjempekomposisjon Rune!! og den gjør nesten at en blir litt såmsvimmel og kjenner det i magen bare en ser bildet faktisk. God helg ønskes deg også. Anneklem. I agree that B&W is perfect for this photo, Rune. Wonderful angles and shapes, and having the person in there adds to the contrasts too. Her var det mange kjente steder og mange flotte bilder. I agree about the monochrome, Rune. The gleam on the metal, plus the dizziness, plus the fabulous addition of half a human with a prominent hand--color would have added little and might have been too much, or at least a distraction from these compelling patterns. I find staircases like this alienating and you capture that very well. Did I mention that adding half a human is a stroke of genius? Oh, maybe I did. Well, if he doesn't feel alienated, he should. Sort-hvid fokusere os på den fine komposition af linjer, dybden og den perfekt placerede person. The perception of a long climb up which made me think of elevators. I'm still after the perfect staircase image ... yours is simply beautiful. Mange flotte bilder her siden sist jeg var her inne! Du har fått dokumentert brannen godt! Ja det ser jo ut som en vulkan også, på det ene bildet. Og så likte jeg de kranbildene godt! Spesielle og stilige! Such a great comp, perfect positioning of that figure on the stairs. I love this one, Rune. Did you use Nik Silver Efex on this one too? The grays are silver. En stram og sterk komposition med intense toner. Vedlig bra Rune!